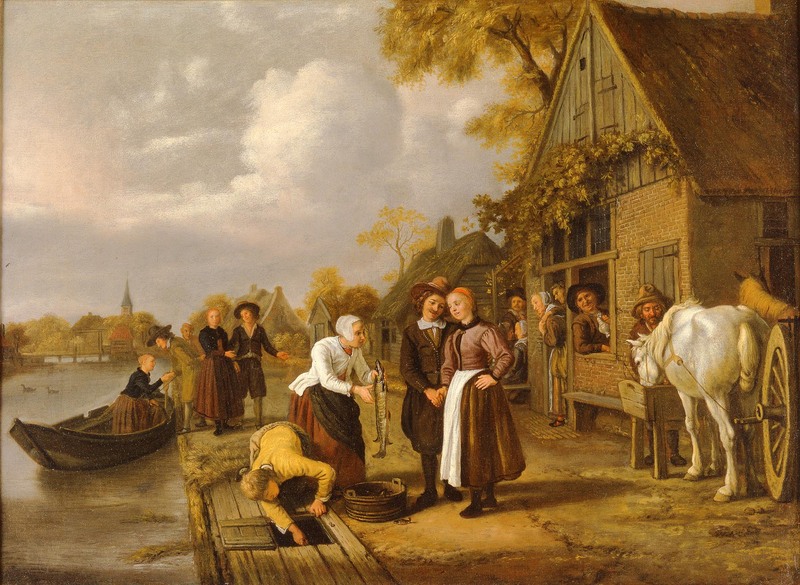 Jan Victors (Dutch, 1619–after 1676), The Marriage Trap, ca. 1640–60. Oil on canvas. Milwaukee Art Museum, Gift of Richard and Erna Flagg M1974.233. Photo credit: John Nienhuis, Dedra Walls. With The Marriage Trap as an example, we have seen that it is an immense task to do provenance research for all paintings that were probably in Europe from 1933 through 1945! Museums, however, have accepted this ongoing project as an important part of the stewardship of their collections. In this particular instance, at least we know that our painting was processed through the appropriate channels after World War II. It was returned to Austria for restitution to its owner; we do not know who ended up with the painting. All we can do is be transparent about the provenance and hope more information comes to light in the future. So, now that we’re done as much as we can about the provenance with the resources easily available to us, all of the documentation goes into the file for the object. Then, it’s time to write up the information for our collection database. Like most museums, the Milwaukee Art Museum uses a database for keeping track of all things related to the collection. 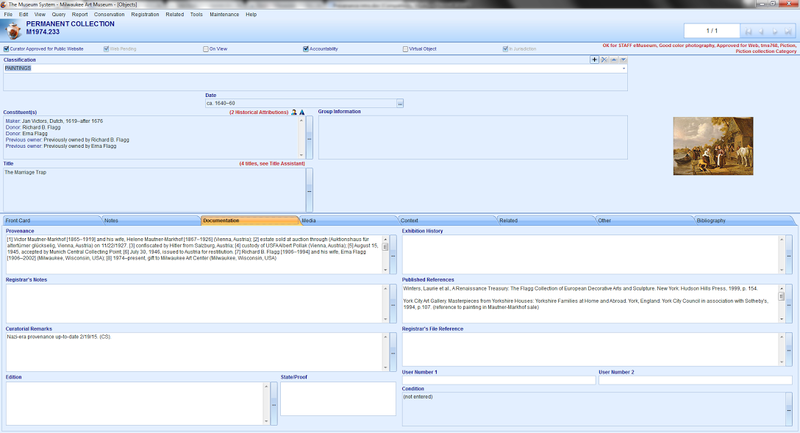 We use one called The Museum System, or TMS, You can see a screen shot of it at the bottom of this post. Reading a provenance entry–even when you know the story–can be pretty daunting. So here’s an explanation of the above. The first section lists the owners and transition between owners. Dates for people are given in brackets and their location is listed in parentheses. For dealers and auction houses, the entire name and location is listed in parentheses. If there is a direct connection between two entries, they are separated by a semicolon. If the connection is uncertain (there could be owners in between), they are separated by a period. Each step in the ownership is preceded by a number in brackets. That information is cited under that number below—so that anyone can go back and find the source of the provenance. The citation can also include further explanation. Of course, even though this provenance is documented as thoroughly as possible right now, there are still a lot of holes. As new information comes to light, it will be added to our records. It’s a never ending process, which requires constantly keeping your eyes peeled for more sources and systematically searching for information. Some day, I hope to visit archival repositories to see if I can find additional paper documentation. Provenance research certainly keeps me busy! This entry was posted in Art, Behind the Scenes, Curatorial and tagged Dutch art, germany, provenance. Bookmark the permalink.